It is to your advantage to compose your manuscript in the proper format. This makes you look like a professional writer, whether or not you have sold a story. 1. Select a type that is easy to read, such as Times New Roman, Courier or Arial. 2. In the upper left-hand corner of the first page type your name, address, phone number, and email address. 3. 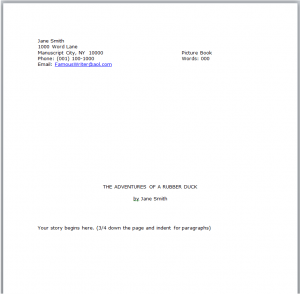 In the upper right-hand corner or the first page type in the genre of the manuscript and an approximate word count. 4. Halfway down the first page, center the title using all caps., followed by your name. 6. Allow margins of 1-inch on each side of the page. 7. Number each page consecutively (look at sample format). 8. With the exception of the first page, include your last name and a key work from the title on each page in the upper left-hand corner and put the number of the page in the right-hand corner.